For this month’s “occupation” theme I wanted some- thing unusual and adventuresome. My first impulse was to do a deep sea diver and then I wandered to astronaut and archeologist and even garbage maintenance before I returned to the ocean. Maybe she’s a treasure hunter. Maybe she’s an oceanographer or cetacean biologist. Or maybe she just teaches scuba lessons. 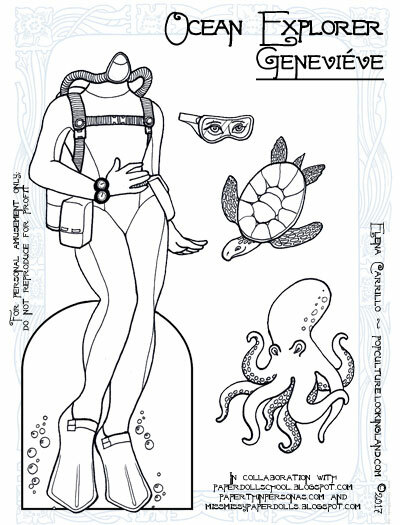 That’s what appealed to me about the dive-wear: there’s so many different things she could be! You get to pick. In the meantime, I included some fishy friends she might encounter on her dives. Running behind in all things due to the long holiday weekend and traveling. 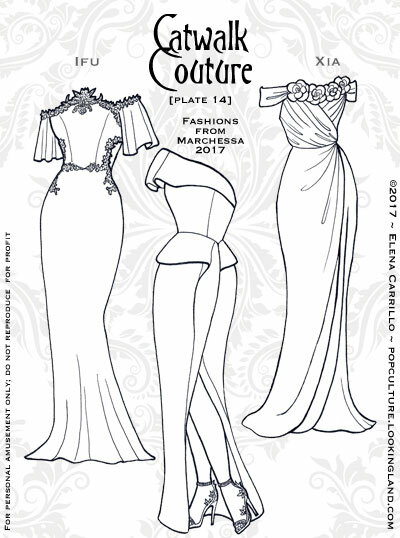 I’m traveling next weekend as well, so I might as well say up front that there won’t be a Couture post for the first Sunday of June unless I pull some kind of miracle out before Friday morning. But that’s all right. Missing dates doesn’t make me too crazy when I know it’s going to happen. There’s not a whole lot I can do about it. In the meantime, have some more Balmain jackets (and lace-up boots, as promised!). 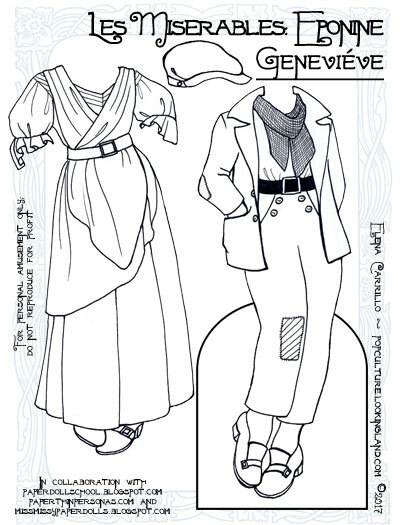 These are kind of designed to go with the Balmain pants from Plate 17, but I can’t guarantee the fit–might need some futzing. And I don’t know about my colors here either. Niall’s jacket was originally black, but I figured you had enough of that. I tried to be faithful to the colors on Lonan’s, but it doesn’t really look right. Once again, this is why it’s best if you pick your own! 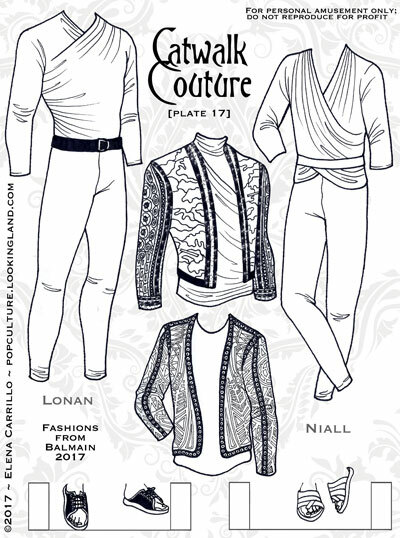 Lonan’s other jacket on this plate was red and black, and Niall’s was a sort of camel color or dun like his pants (which look more yellow than they should here). Balmain’s not afraid of color, though, so I say just go crazy and make yourself happy! Might take a little break from these characters once I post the 20th plate. Not only do I need to do lots of drawing to get ahead again, but I also want to work on my poor neglected Klondike dolls. I really miss doing 19th century subjects at this point, and those are just itching to be completed. I’m trying to be better about finishing things that I start, so I want to make sure I get the Klondike dolls and some plates for them posted. Preferably before the end of the summer. I’ve got miles ahead before they’ll be ready, so I need to focus on that for a spell. And I keep saying I want to get back to Judy and haven’t even start there! We’ll see what the vagaries of the blog may bring. 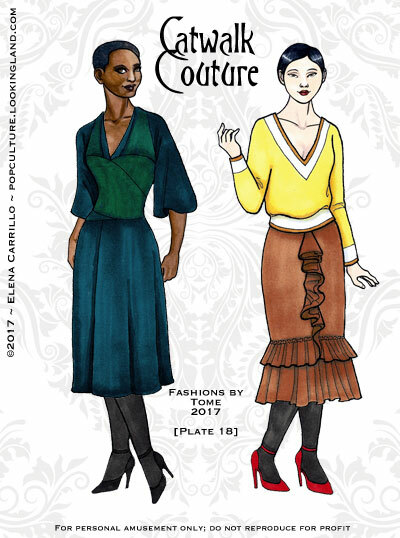 Hopefully in two weeks: summer fashions for all the couture characters! I don’t know why Tome seemed like a good idea at the time that I actually drew these dresses. In retrospect they’re not terribly interesting. Maybe I was just looking for something simple. I tried to perk up the dress that Ifu is wearing on the left a little. It was originally a sort of dull brown color. I don’t doubt my bias toward the men also played into this, but I’m going to do some Balmain for the ladies next. Hopefully that will even out the score. Balmain makes lots of amazing women’s clothing too, after all! 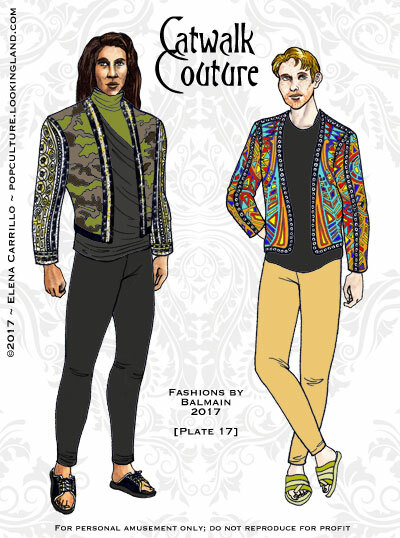 It was Balmain’s clothing for Cookie on Empire that actually inspired me to want to do modern fashion paper dolls in the first place. I guess the other thing I liked about Tome was just the clean lines on the dresses; sometimes simplicity is nice. This is my idea of simplicity with style. When I see women in cotton sacks that hang from their shoulders–that’s not simplicity to me; that’s farmwear. Tome has a lot of form-fitting clothing that I think would flatter most body types. The knit dresses maybe not so much (honestly, who can wear those unless you’re skinny as a q-tip?). 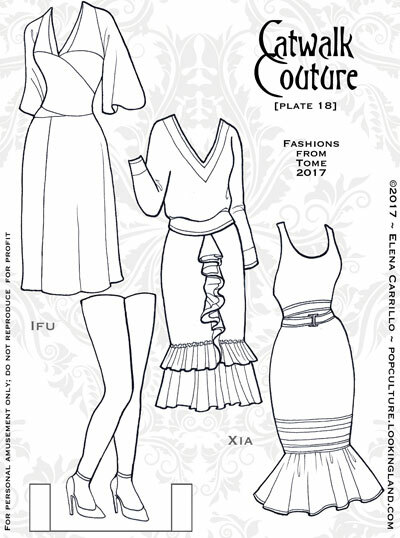 But I think, for example, the dresses on the colored plate here would/could look good on pretty much anybody. That’s a nice thing even if my models are rather idealized. I’m not good at making different body types for my paper dolls and I know that’s a shortcoming, but I’d also mostly made my peace with it. So I want to at least be conscientious about what they are wearing. 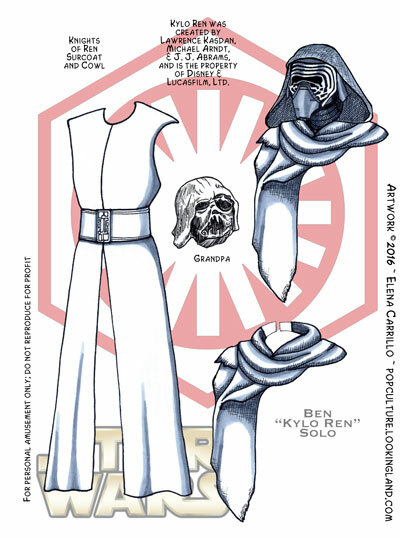 You will not likely see any shoulder-hanging sack dresses here ~ ha! I still have done nothing to remedy the fact that I am out of plates for this series and haven’t managed to get anything else going. I’m hoping to get to work on the Balmain stuff for the ladies (and right soon), and I have no idea what I’m doing next for the men. Might do something simple like a mixed swimwear page for everybody. It’s summer, why not? Next: more jackets and boots from Balmain for the menfolk! I didn’t leave myself enough time to paint this week’s plate, so I slapped some color on this in Photoshop. Will have to go back and replace it when I have a chance. Just didn’t want to miss an update since I managed to draw this at the last minute. Miracles do happen! This is probably the first of many Balmain plates. This is a designer I absolutely love. A lot of it borders on costume rather than practical everyday wear, but somehow it manages to pull off a lot of glam and still look sophisticated in some way. Balmain does a lot of stuff in black that I adore, but also has some startling bright colors in the mix now and then. I decided Niall would definitely be on the “bright colors” end of the spectrum. I tried not to pick all black stuff for Lonan, but yes, here’s another pair of black pants. Of course, with the uncolored plates, you can make them whatever you want: denim, fuchsia, marmalade–just go for it! 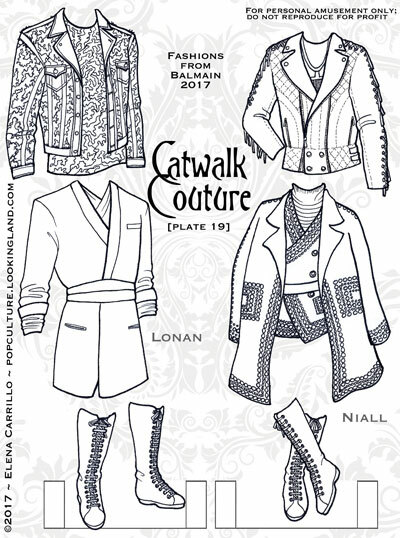 The pattern on Niall’s jacket is definitely an approximation. I started out trying to be faithful, but when the shapes get that small, I tend to give in to my laziness. That jacket is actually beaded, which is insanely impressive when you see it up close. It probably weighs a ton. I gave them both sandals for this plate (so they are kind of Spring/Summer still). 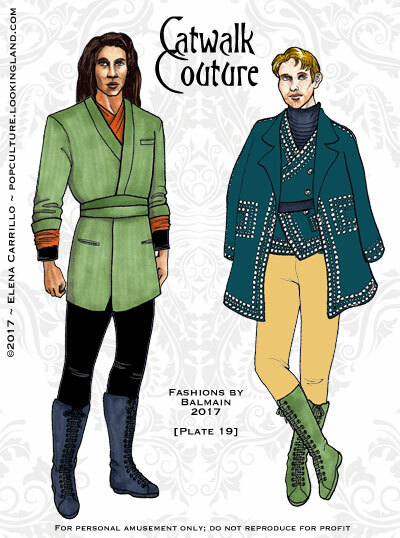 The next plate for them will have more cool jackets and boots instead. Totally love the fussy details on all of Balmain’s stuff, though it is painstaking to draw–even when I’m fudging it. I probably can’t do many of these items justice, but they are fun to try render. At this point in my life I don’t know why I am still so surprised how easy it is to fall out of the habit of drawing regularly. And how once you do, it’s all that much harder to get back into it. I’m going to try to get back on a schedule of making sure to always incorporate it into my week. Lastly, a big Happy Mother’s Day to all you fine mothers out there! Next week: more from Tome for the women. This week some toned-down styles from New York designer Tome. I never quite know how these plates will come out. 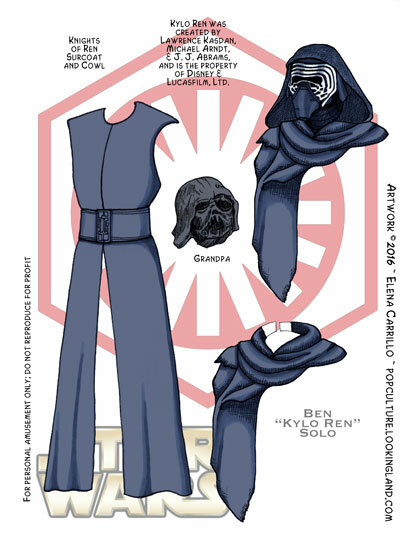 Sometimes the clothes look fabulous in the pictures but not quite as exciting as paper doll pieces. I did two plates of Tome and I think they both look flat. But I’m sharing them anyway! And yes, I cheated a little because Xia’s hosiery and shoes are actually on the next plate even though I included them in the colored example here. I also would like to point out that these stockings ended up being thigh-highs instead of full panyhose/tights because they wouldn’t have fit on the plates otherwise. They can still be used to mix and match with other dresses and skirts, though. I don’t think I have drawn anything yet that is so short as to not cover the tops. These are the colors of the original dresses. You can probably come up with schemes to make these a lot brighter. Again, color and I have our good days and our bay days. I do the best I can with what I have. This is the end of my buffer on this set, so I might be scrambling in the coming week. I just haven’t had sufficient focus to draw and that’s put me very sadly behind. It’s frustrating, but you can only do so much with the time and energy you have. Still, I cleared off my desk this weekend and hopefully that’s a first step toward getting organized and being able to narrow down my concentration. I’m also looking to buy a new computer this summer and doing that conversion is always incredibly painful for me. I’m going to try very hard not to drop off the face of the earth, but there’s a good chance the posting will get even more sporadic. I don’t want to drop the blog, so I might just change gears a little while I make transitions. In the meantime, I do have some Star Wars plates to post, and I will push myself to pull a plate together for the guys. I have absolutely zip at the moment. And since I haven’t been painting my Klondike dolls like I hoped to be doing, maybe I can get Judy back on the docket. She’s always easy because she’s so low-pressure. Some days I wish I was just doing everything with a black pen and nothing else! Lots of fire, too many irons. Pretty much the story of my life. 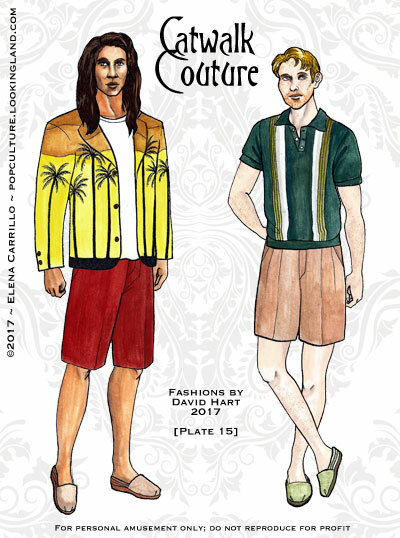 I probably have said it before, but it bears repeating: I really strongly (strongly) dislike spring/summer fashions. Maybe especially on men. So pulling this one out was real work for me. I don’t hate the plate, really. I actually like their tropical shirts and they were fun to draw. The shorts and the shoes, though. Ugh. Give me the willies. I’m pretty sure Lonan hates them too (though he looks good, so there is that). Niall, on the other hand, definitely strikes me as a summer person and I’m sure this is not the last of the khaki we’ll see on him. That polo shirt totally makes my skin crawl! I have been horrendously busy and neglecting this blog, which means I’m coming to the end of my couture buffer with no backup in sight! I’m hoping to double-down on my drawing efforts in the next few weeks, though, but posting may continue to be sort of sporadic. Summer is always a struggle, I guess. And once again, it’s not for lack of reference material, that’s for sure. My reference folder is so out of control I could probably ignore the fashion sites for the rest of the year and never run out of material to work from. I’d like to randomly point out, as a matter of process, that Niall’s awful shirt is the same color as Ifu’s dress from last week. This is because I mix all my own colors from a palette of alizarin crimson, indigo, and yellow ochre. Then I mix those and use Payne’s grey, sepia, and white to modulate the tones. Aside from the crimson, technically these aren’t the colors you should mix with (bad color theory! ), but I like them. It does make it hard for someone as lazy as I am to get a lot of particular shades. I still can’t make purple at all (which is why you never see purple here). I taught myself to paint with gouache that my dad got from some sign painter when I was a kid. Still have his tubes 20+ years later and the pigment is still good. So this is to say: all of my habits are bad and I probably work twice as hard as I should on this stuff. One of my goals this summer is to make purple. Maybe add proper yellow to my palette. And proper blue as well. And maybe then the painting won’t be so hard. We shall see. 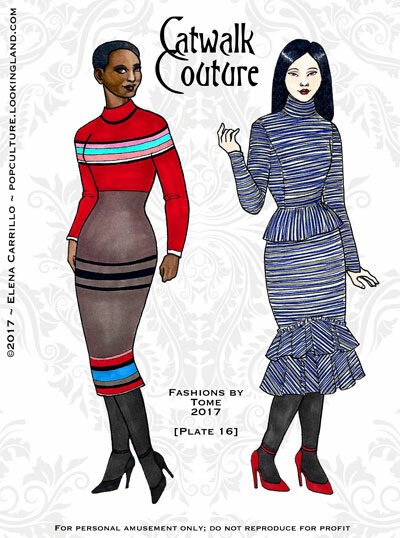 Next week: fashion from Tomé for the girls. Where have I been? So terribly busy! Good stuff, but no time to tend the garden here despite having prepared a buffer of material in advance. But my schedule is opening up and hopefully I can gt back on track in some fashion in the coming week (pun intended). To get us back in the mood, here are some jewel-toned gowns from Marchessa! 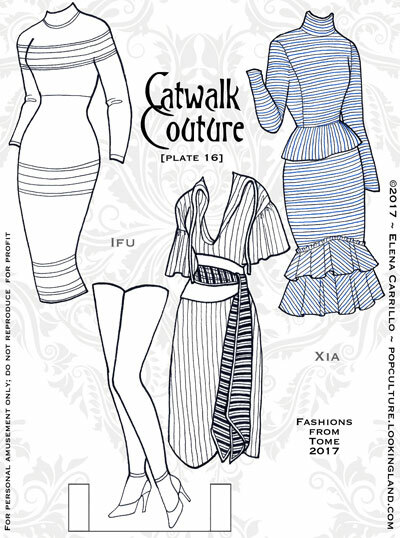 Ifu’s dress on the left is fairly accurate to the original color, but Xia’s on the right was actually that pale bright yellow that’s all the rage right now. I decided to change it since Xia’s Oscar’s dress was already that shade (and it’s a color I’m not that fond of). Anyway, I much prefer this rich golden tone instead. I also realize that I desperately need to make more hairstyles for the women. I’ve still got a handful of plates to post that have been done since March or early April (I forget). So it might be a while before I get to offer up more hair options for these lovely runway models. I also have failed to make a decision about what to post next. 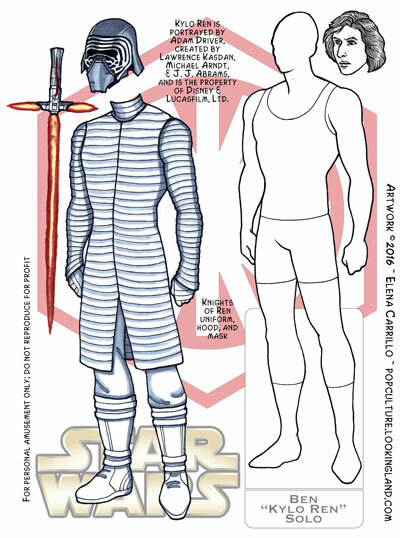 I fell behind on the Klondike paper dolls in the last couple of weeks, but I might be getting back to them. 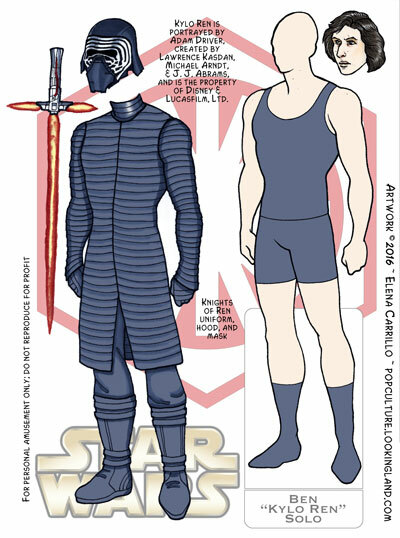 Also, I still have lingering Star Wars dolls to post. I’m just so disorganized. As I said, though, things are settling down. Hopefully I can focus on what I want to do and get some regular posting going on here again. I hate falling out of sync with this blog because it’s hard getting the momentum going again. But I’m going to try to post at least a couple of times this week. Even if it’s stuff about paper dolls and not actual paper dolls themselves. I’m no good at “how I do stuff” kind of posts, but I can definitely share things I love that other people do! As always with this series, if you want to make suggestions or recommend a designer, I’m game for that. 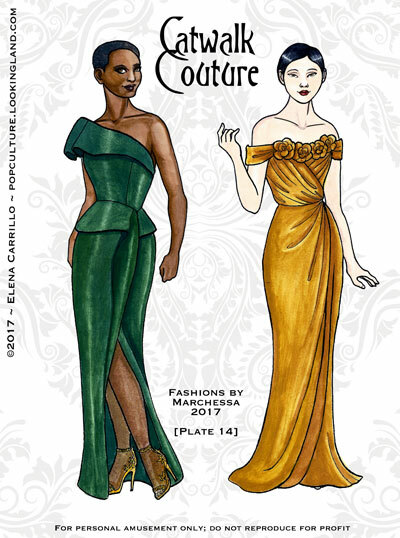 Couture is certainly a bottomless pit of possibilities! 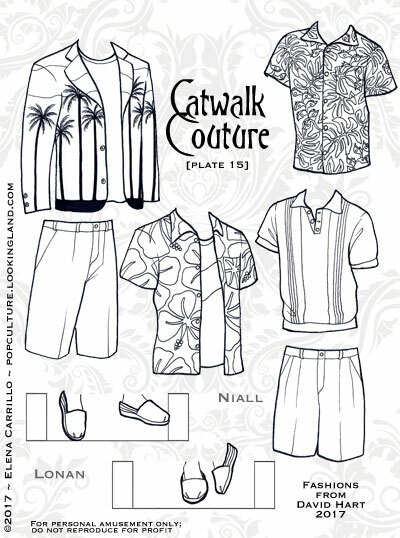 Next up on the catwalk: something a little more “Springtime” for Lonan and Niall!